Have you ever looked through a copy of the 1902 Sears Roebuck catalog? It’s 1,192 pages packed full of anything and everything anyone might need from windmills, buggies, furniture, and cooking utensils to fabric, hair brushes, phonograph records, and ready-made clothing… with everything described in the most minute detail. 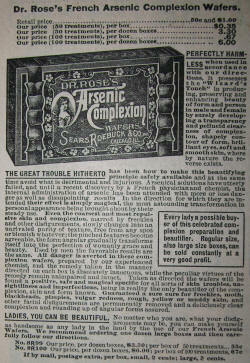 Some of the most interesting items for sale, I think, are the medicines and personal care products, like the Dr. Rose’s French Arsenic Complexion Wafers (ad shown below). I especially enjoy the grandiose phrasing but stilted language used to promote these products. In the case of Dr. Rose’s complexion wafers, prospective buyers were led to believe that their regular use would make even the ugliest person beautiful by clearing up any facial “disfigurements” and even softening angular features… in fact, such a transformation was guaranteed if the product was used as directed. And of course, the buyer was repeatedly assured that this particular dose of arsenic was completely safe. Who, I wonder, was Dr. Rose? I have been unable to find any additional information about him. Did he actually exist, or was this just an advertising gimmick? THE GREAT TROUBLE HITHERTO has been how to make this beautifying principle safely available and at the same time avoid what is detrimental and injurious. Arsenical solutions have utterly failed, and until a recent discovery by a French physician and chemist, the internal administration of arsenic has been attended with more or less danger as well as disappointing results. In the direction for which they are intended their effect is simply magical, the most astounding transformation in personal appearance being brought about by their daily use. Even the coarsest and most repulsive skin and complexion, marred by freckles and other disfigurements, slowly changes into an unrivaled purity of texture, free from any spot or blemish whatever; the pinched features become agreeable, the form angular gradually transforms itself into the perfection of womanly grace and beauty. Used by men the favorable results are the same. All danger is averted in these complexion wafers, prepared by our experienced chemist, and the remedy taken in the manner directed on each box is absolutely innocuous, while the peculiar virtues of the remedy remain unimpaired and intact. Taken as directed the wafers will be found a positive, safe and magical specific for all sorts of skin troubles, unsightliness and imperfections, being in reality the only beautifier of the complexion, skin and form known. Guaranteed a sure cure for freckles, moth, [was this supposed to be moles?] blackheads, pimples, vulgar redness, rough, yellow or muddy skin, and other facial disfigurements are permanently removed and a deliciously clear complexion and round up of angular forms assured. I don’t know about Dr Rose, but a recent report here about the famous Vichy waters (which I drink as an aid to digestion and general well-being) gain their tonic effect from traces of arsenic. Appearently it raises the metabolism. I love the way you share these old snippets from the past. Please keep doing that. Love your blog BTW. I don’t know if they were Dr Rose’s wafers, but my grandmother told me once when I was a little boy that she used to take little arsenic pills when she was younger and that they were a beauty treatment. It sounded crazy to me then (and it still sounds crazy to me now) but she lived through it and actually lived into her 90s. I really like to read your articles, the looks into the past are especially interesting. Keep up the good work. Isn’t it a shame that — then and now — people are willing to poison themselves to try to be more attractive? Glad to have found your blog and looking forward to future posts! I have not yet begun to do any research on homeopathic treatments for humans, but I recently purchased ‘Dr. Pitcairn’s Complete Guide to Natural Health for Dogs and Cats’. He is known as the father of holistic and homeopathic veterinary care. 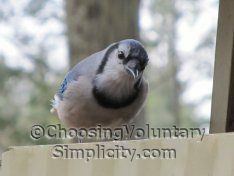 Many of the homeopathic treatments that he recommends include small doses of substances which would be otherwise deadly in any great quantity. I do not know anything about the principles behind homeopathy, but apparently they work. Arsenicum album (arsenic trioxide) is used in the treatment of Feline Leukemia, for one example. Digitalis purpurea (Foxglove), Belladonna (deadly nightshade), Mercurius vivus (quicksilver), Lachesis muta (bushmaster snake venom), etc. are some of the various other “deadly poisons” used to safely treat pets homeopathically. Who knows if the Arsenic Complexion Wafers were ‘safe’, but I doubt the pursuit of beauty would be reason enough to try it. But then again, even today people are engaging in risky procedures for vanity’s sake. I looked up moth and one definition for it was “mote.” I looked up mote and this can mean a speck or particle. Ah, yes, the good old days prior to the establishment of the US FDA. Arsenic really does alter and improve the complexion, the most notable effect being a luminous translucency which is lovely to see. Ladies used it for ages, particularly actresses and “great beauties” of their day, but the problem was always dosage. How pure was the arsenic you just bought, versus the arsenic you have been taking at a given dose safely? Given that the ladies WERE going to take arsenic, this product was probably the safest way to do so. “Moth” probably referred to a skin condition called chloasma, which causes darkening of the skin of the face in a pattern that often looks like a huge moth centered on the nose. It’s caused by exposure to sunlight and high levels of female hormones, so our rough living, hard working, often pregnant fore-mothers were very susceptible to it. In most cases, modern treatment involves quite complex skin ointments.